It’s been a while since I’ve done a showroom sneak peek, so a long overdue visit to Gus’ dungeon of delights was arranged. It was a combined visit with Petesy and you can find his write up here (and the second bit here). It was good to get back together, it’s been far too long since I’ve seen these guys. Peter’s got a handle on the right stuff and is frankly better at this so go read his stuff first. I’ll not duplicate too much hopefully, just add some words and photies of what grabbed my attention. There’s a fair bit that took my interest too. For starters, Haglöfs are focusing more on their Swedish heritage, with some design callbacks to traditional styles. Heritage means a lot and experience is where it’s at, so this is a step in the right direction for me. 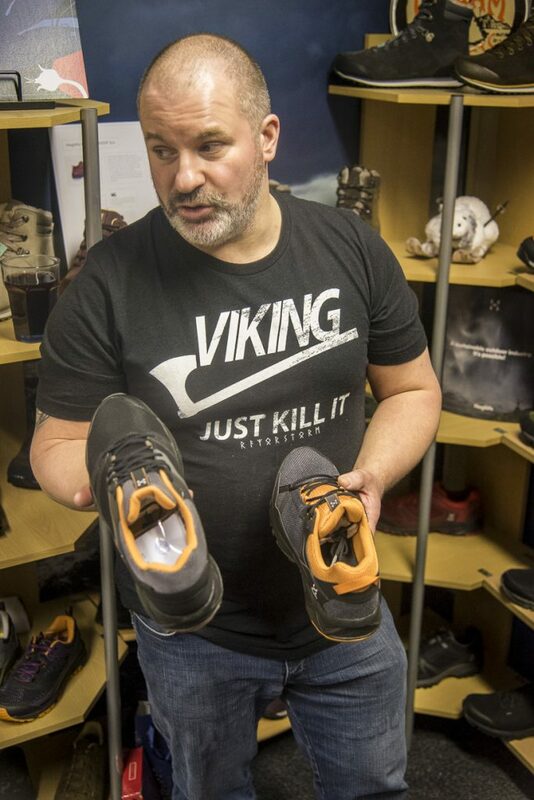 The whole Alpine market is crowded and what works there isn’t always the best choice for the Scottish mountains, whereas Nordic kit is closer to what works here. The other good news is that they’ve also had a look down the back of the sofa and found the missing colour palette. Proper colour is back, hoorah. A word of warning, the photies are a white balance nightmare, the camera struggled a bit with a mix of flourescent and daylight and I hadn’t thought to take any filters. It’s either that or maybe Petesy has jaundice and should seek medical attention. So onto the goodies. First up the Spitz Jacket, which has had a few minor tweaks but it still the solid all year hard shell that is a firm favourite with me. 3 Layer Gore Pro 40D Polyamide, with 70D reinforcement, along with one of my favourite hoods ever. In orange too. Oof. 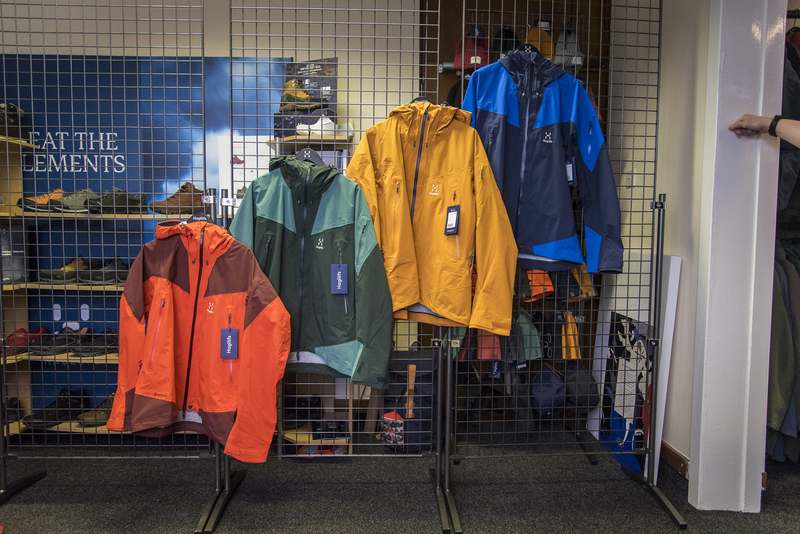 Coming up alongside we have the Roc Spire jacket, which is a a solid mountain design, 3 layer Gore Pro 30D Polyamide with 70D reinforcements. The hood is excellent, just like it’s stablemate the Spitz. There’s even built in RECCO for those who like to play in the snow. That is a damn fine idea. I like this for a winter shell. Those colours make me feel all 90s again. Regulars round here will know I’m not a fan of the whole concept of DWR, specifically the D part of that. 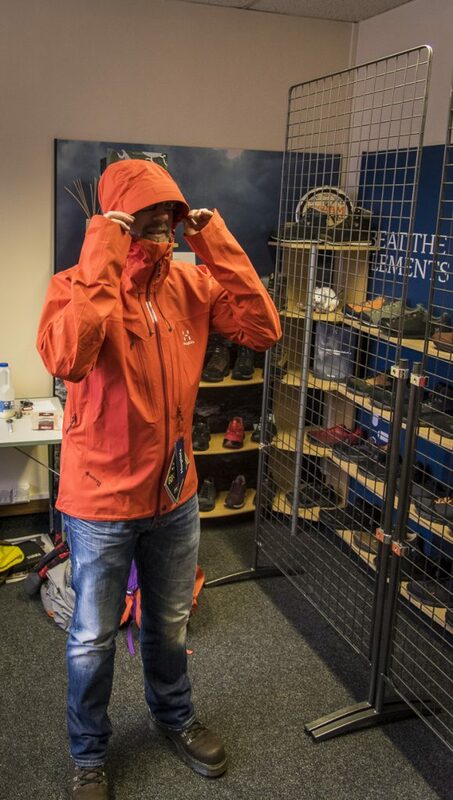 My nose started twitching at the sight of the new LIM Shakedry Hood. The concept of Gore Shake Dry is mighty tempting. No face fabric to wet out, no DWR to wear off. Apart from making me think of the tune from the old Shake’n’vac ad every time it’s mentioned (and put the freshness back) I think this could be a very interesting step forward. That tune is in your head now too. Sorry. There’s a cheeky we Topo stretch panel built into the back to give mobility which is a nice touch. The hood seems decent too. Downside is the Henry Ford colour palette and the fact it resembles a bin bag on the hanger. It’s a nice fit and other colours are on the way apparently. I’ll be paying close attention to this when it hits the shelves, it could be a gamechanger. 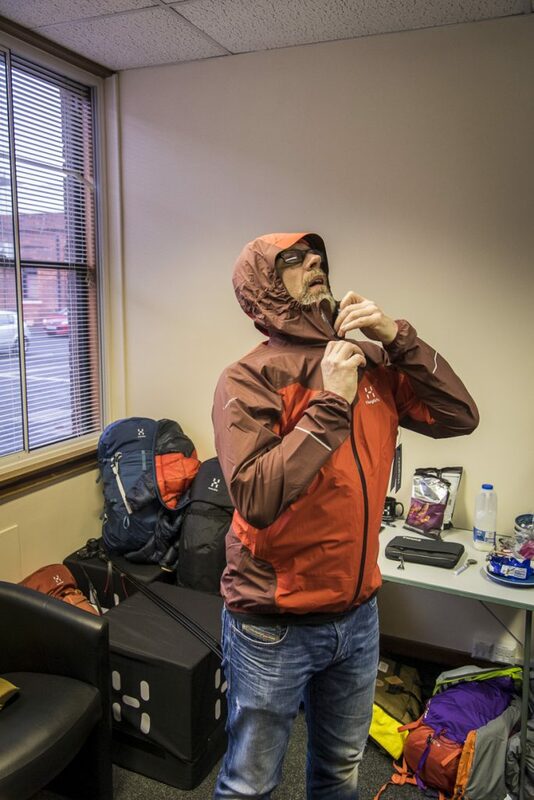 Next up is the LIM Touring PROOF jacket. Aye that’s PROOF not GORE. Proof is the name for Haglöfs own membrane implementation, in a mixture of fabrics. It might give the Gore team a bit of a wake up. 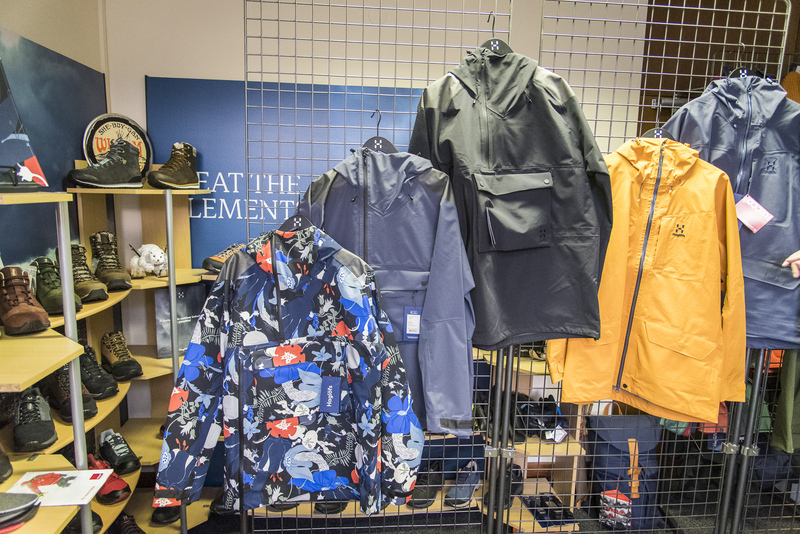 The punters are drawn to the Gore-Tex branding and like a Hoover it’s a term that’s become synonymous with the object itself, but with the Gore leviathan comes rules about material choices and pairings. I get the impression that Haglöfs using their own material will allow some more freedom to do their own thing with design, which can only be good. PROOF seems to be sustainable and eco-friendly, and by design should be durable and stretchy. 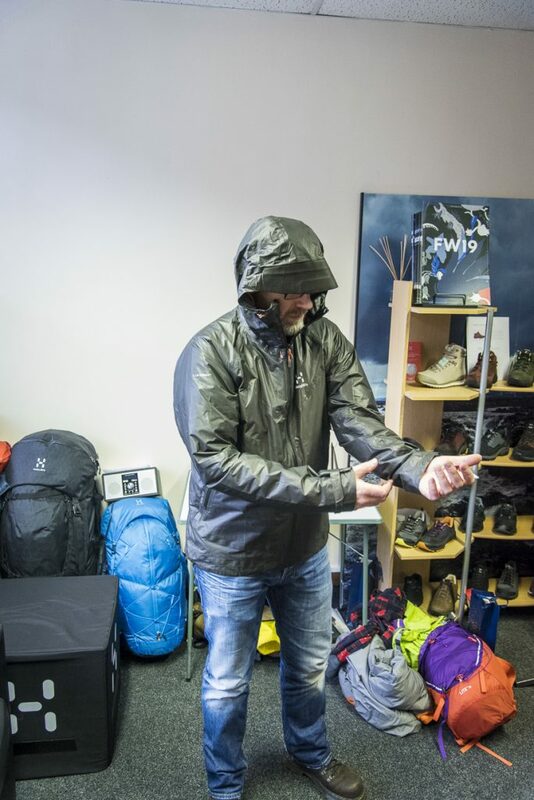 Breathability looks good by the numbers but we all know that’s only theoretical and thermal retention is a factor, but with a HH of 20,000mm the waterproofing should be there. Time will tell I guess. I like the feel of this and design features are good. The hood is magic. Petesy loves a napoleon pocket too. 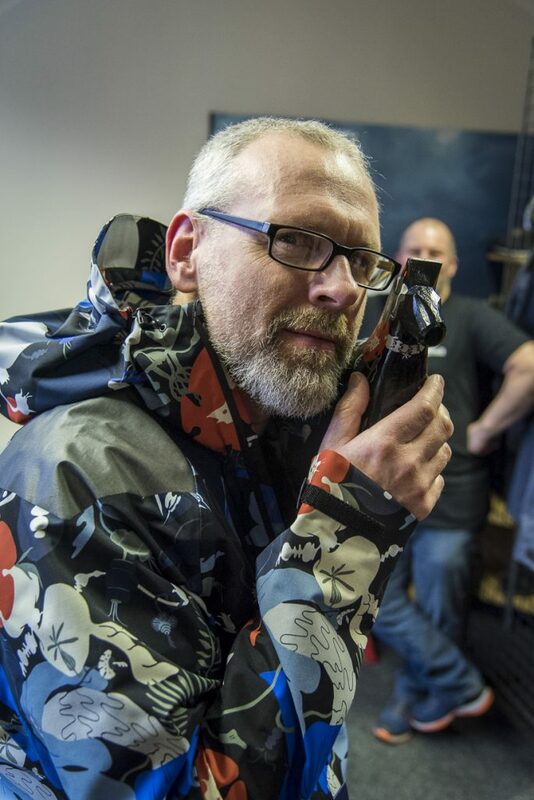 Onto the Edge Evo Parka, also in Proof. It had me at hello. It’s got the Where Eagles Dare vibe going on, in that you feel like Clint Eastwood the minute you put it on. Unfortunately you still look nothing like him. The offset zip is great. The colourful Kurbits version is just a work of cheery traditional-yet-modern Nordic wonderfulness. I learned about Dalecarlian horses that day and my life is better for it. 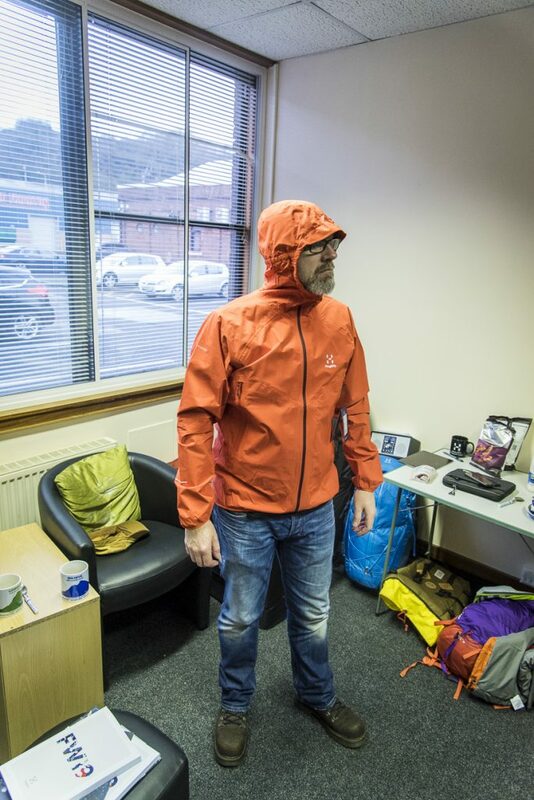 The Parka isn’t massively technical, and the front pocket will probably fill with rain, but I still want one. The LIM comp comes in Gore and Proof versions. 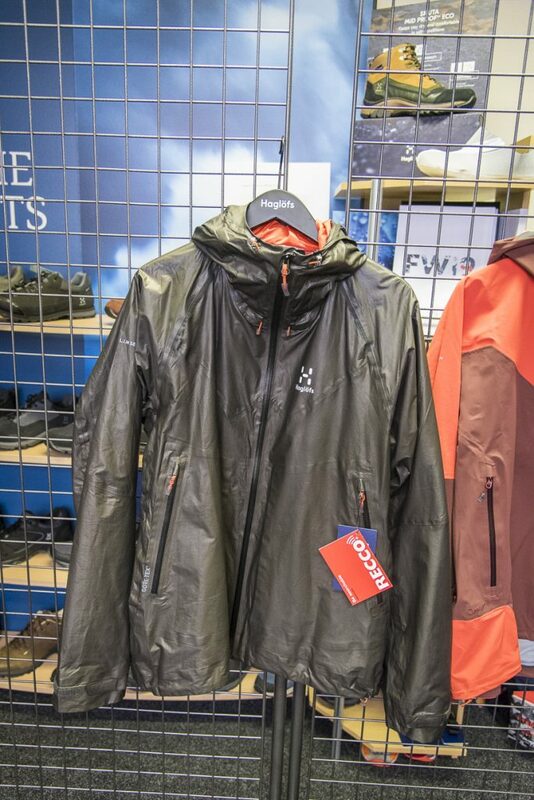 Proper light at under 300g this has a go-to 3 season packable shell written all over it. A minimal but not entirely disappointing hood means it probably won’t make to winter but we’ll see. Insulation now, and we’ve got down and synthetic to play with. You’ll maybe remember that the LIM Essens is one of my favourite bits of kit ever. It’s got 70g of 800fp down, squishes down to baseball size and weighs FA. If you don’t have one of these in your gear store, you should ask yourself what you’re doing with your life. In synthetic, the Essens Mimic has had a bit of a revision since I had one on test. 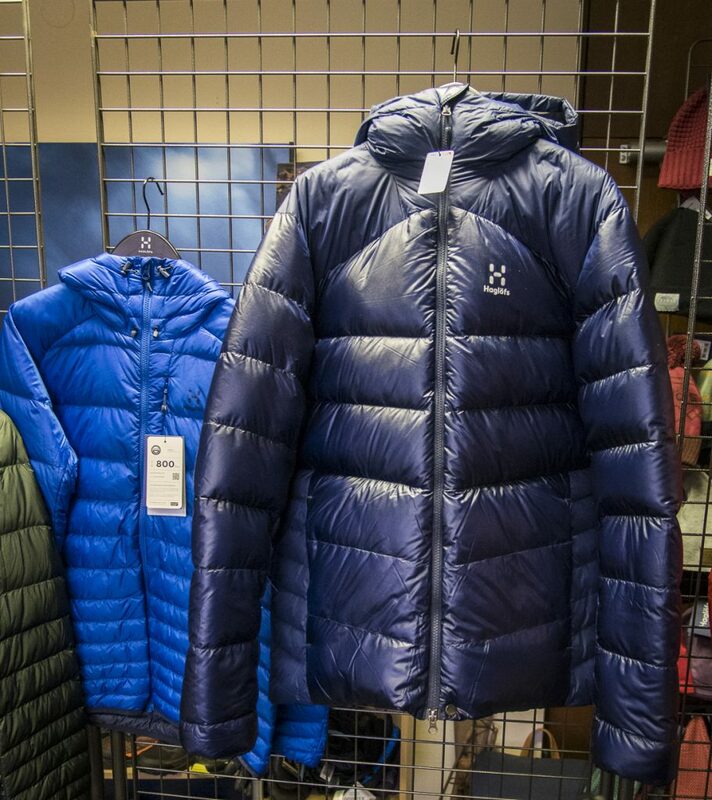 The Quadfusion insulation is a decent material for warmth/weight and good at retaining warmth in wetter conditions. 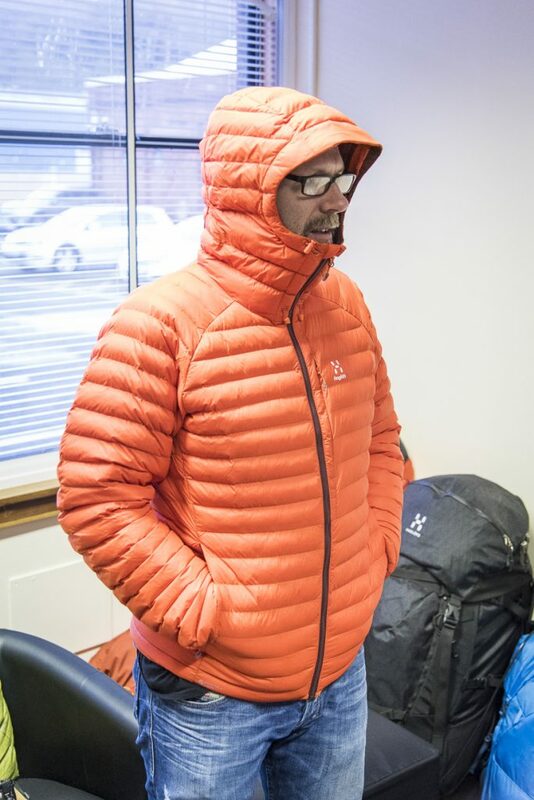 Sizing is good for layering, and the hood feels way better too. Eminently squashable so good for grab and go in uncertain shoulder season weather. The Mojo is like a mobile sleeping bag. 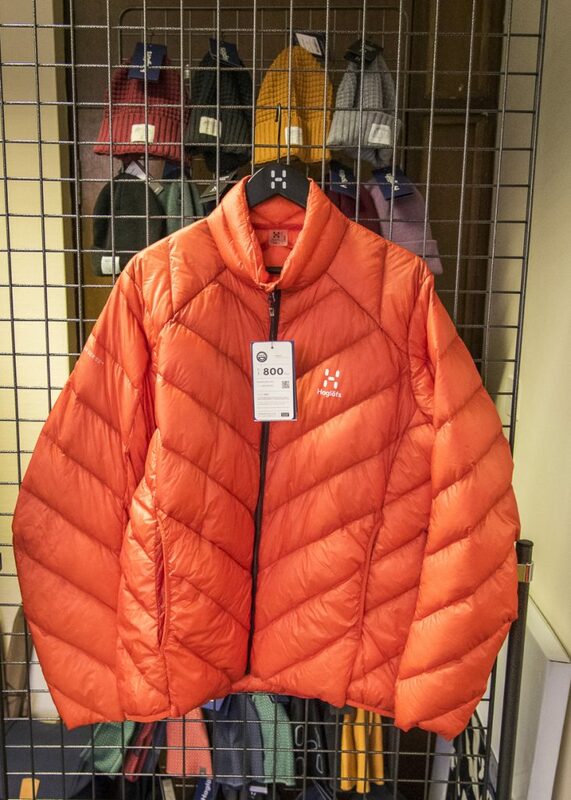 It’s a monster of an insulator, with 390g of 800fp DWR down inside a Pertex Quantum shell. I do genuinely have sleeping bags with less down than that. The hood is like a cosy cavern of joy. 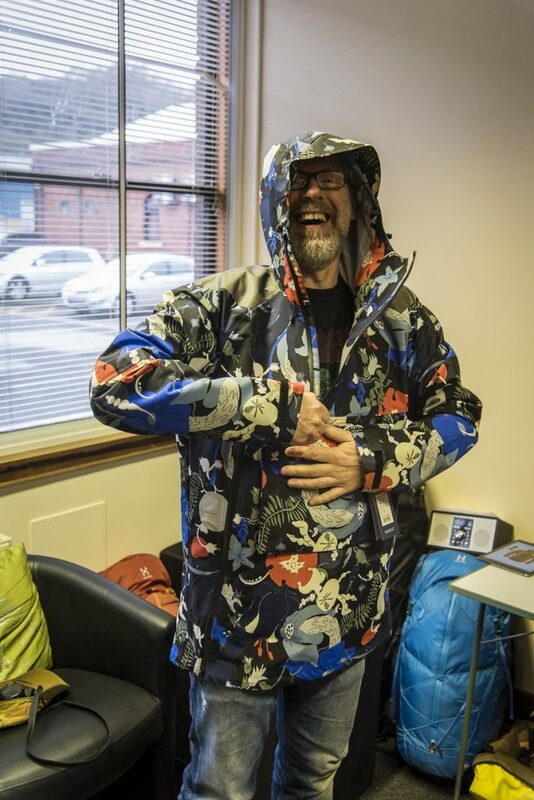 The second you put it on there’s instant thermal feedback, look carefully and you can see Petesy is mentally standing in a snowy camp looking at the stars. 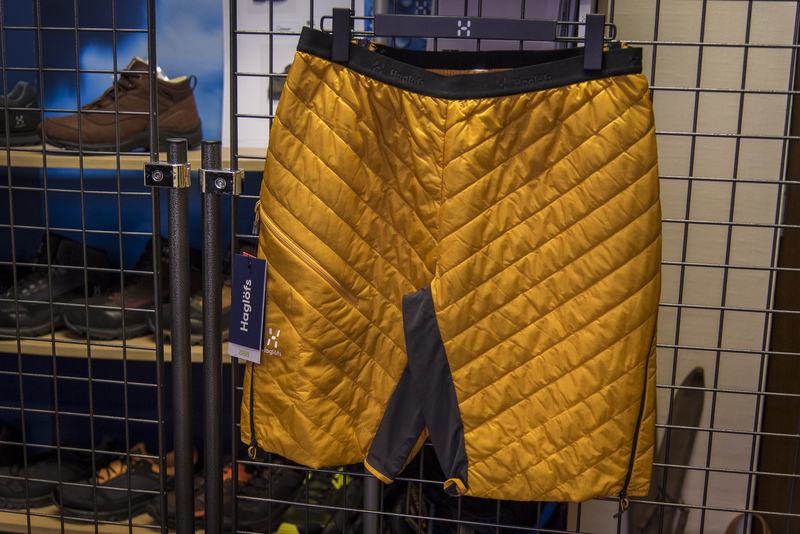 The LIM Barrier shorts are clearly targeted at people who run up mountains, which isn’t me these days. That said, they’d be ideal for popping on over breeks on a cool night at camp in the autumn and it weighs hee haw. 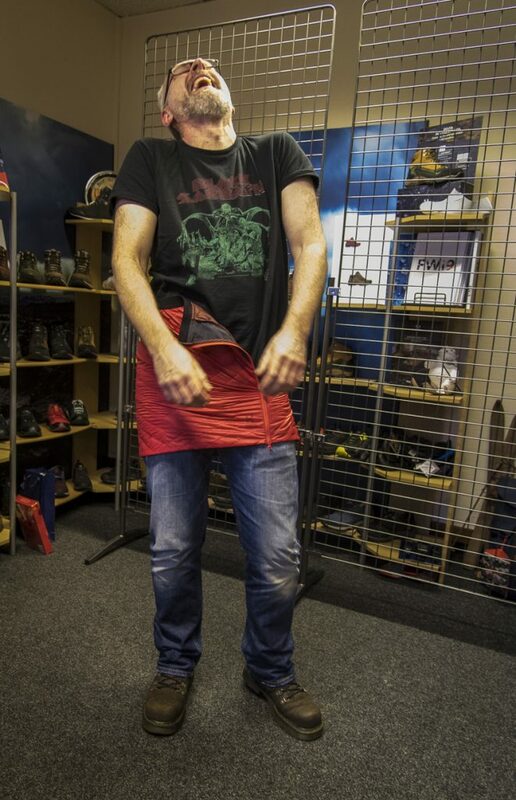 There’s a skirt too, which is really Petesy’s style. 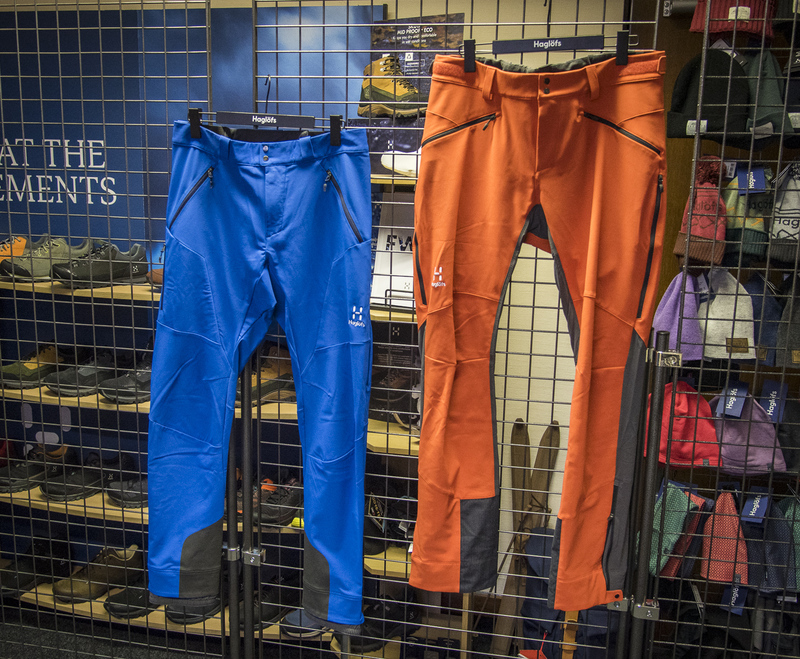 Now onto breeks and we have the Roc Fusion and the Rando Flex. Both use the Flexable fabric which I am a fan of. The Rando on the right is targeted at ski, but other than being a bit flarey for boots, they are multipurpose in my view. Long leg versions not available, so that’s me oot, which is a shame, because I want orange trousers. The lower pic shows the detail texture of the material of the Rugged Flex Pant which feels fantastic. These are like a slimmed down version of the classic Rugged Mountain which you can just see peeking in on the right of the photo. 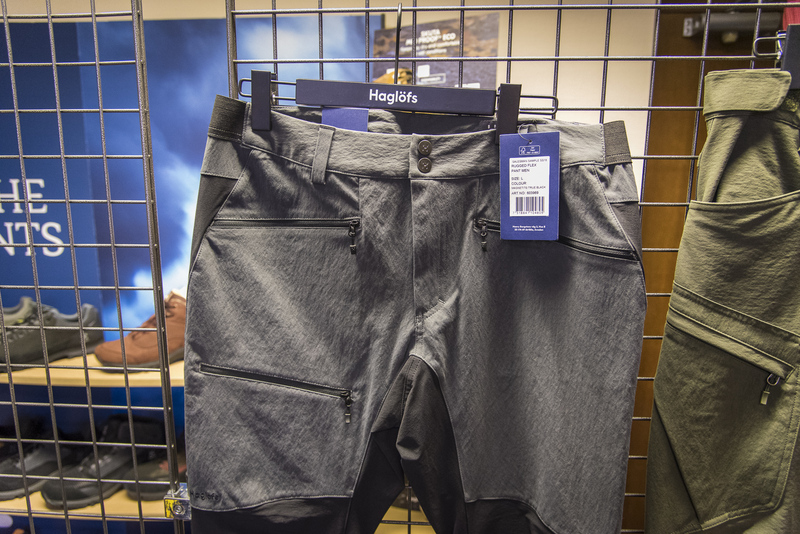 Lighter weight, less flappy, these look like solid mountain trousers. Long leg lengths please. Gloves now, and I must admit with the onset of old age I really have started to feel the cold in my fingers when I’m out and about. I’m almost always wearing gloves so I can’t have too many pairs. 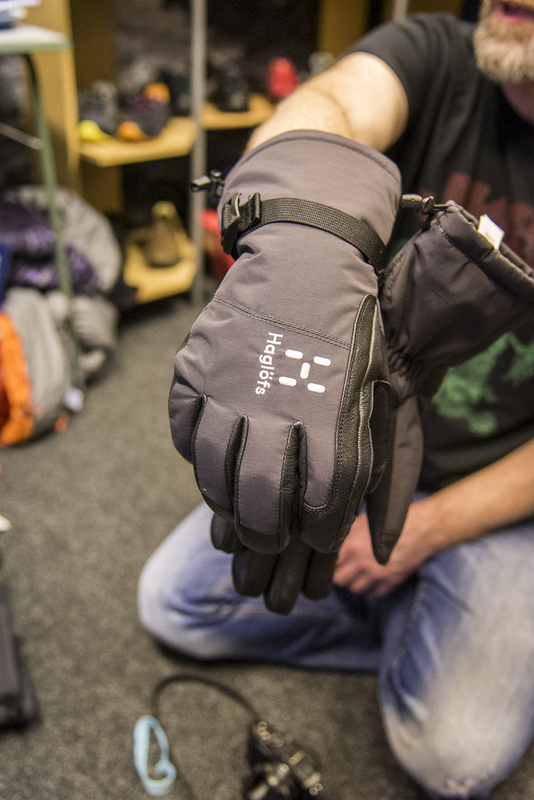 Below are the Nengal gloves which feel like proper winter jobs. Flexable with Gore insert, Quadfusion insulation, goat leather palms. 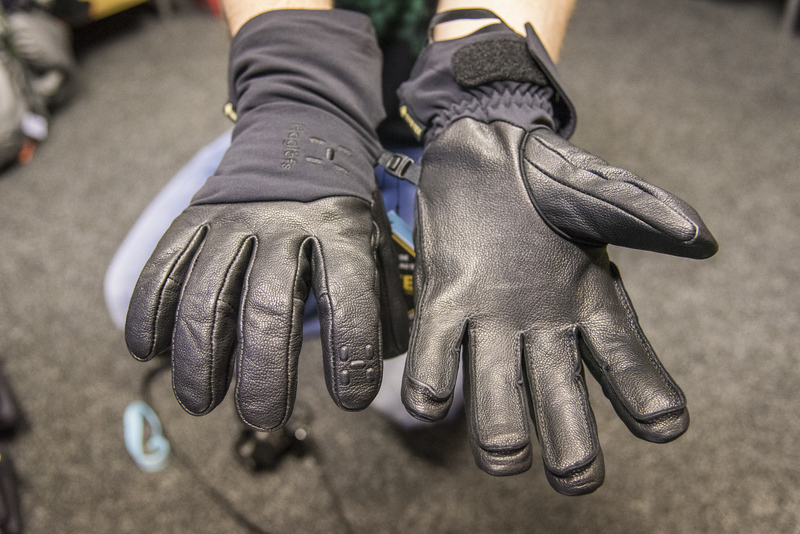 They feel remarkable dexterous for such a sturdy glove, I like these a lot. 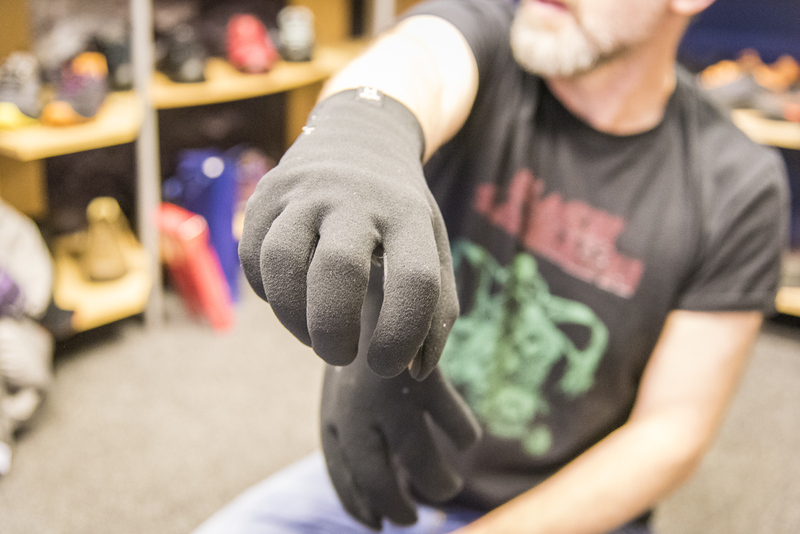 The Niva glove is also new, described as an alpine ski glove, but to me that just means they’ll be warm and a bit dexterous. It’s Proof Eco with a leather palm and decent length. 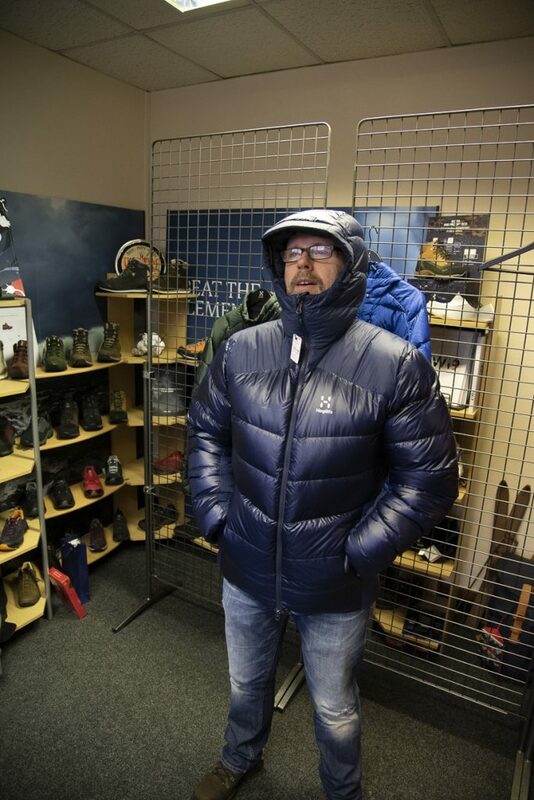 The mitt version below is warm and a good fit. This next photo doesn’t help my case here but the Bow Glove looks like an absolute belter. 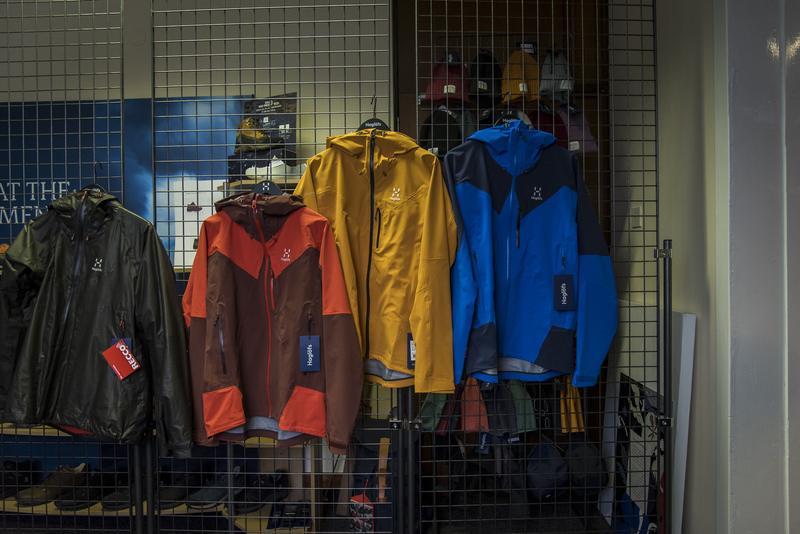 It’s made with Gore Infinium with Windstopper, which is a wind and waterproof softshell basically. 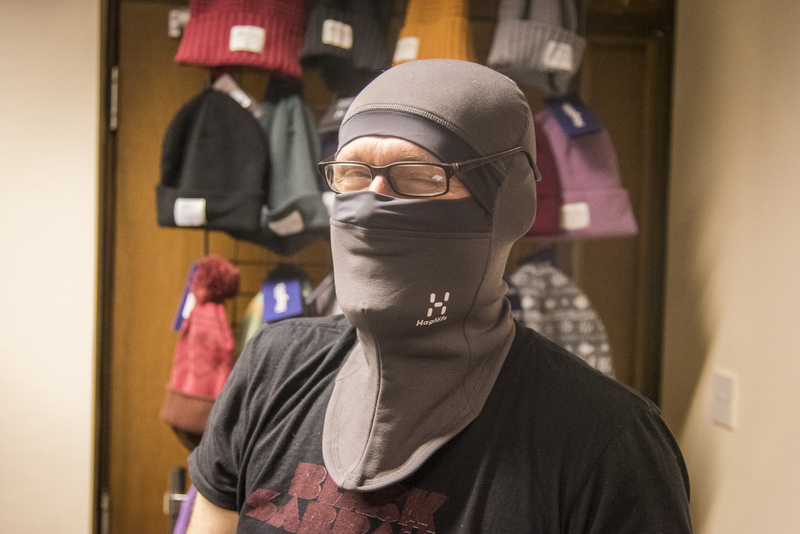 Super duper dexterous but warm, these could replace the powerstretch chaps I wear all year round. Very keen to take these for a test drive. Petesy has a good photo of the grippy palm too. Check it out. Lastly it’s footwear and the Proof material makes for the standouts here. 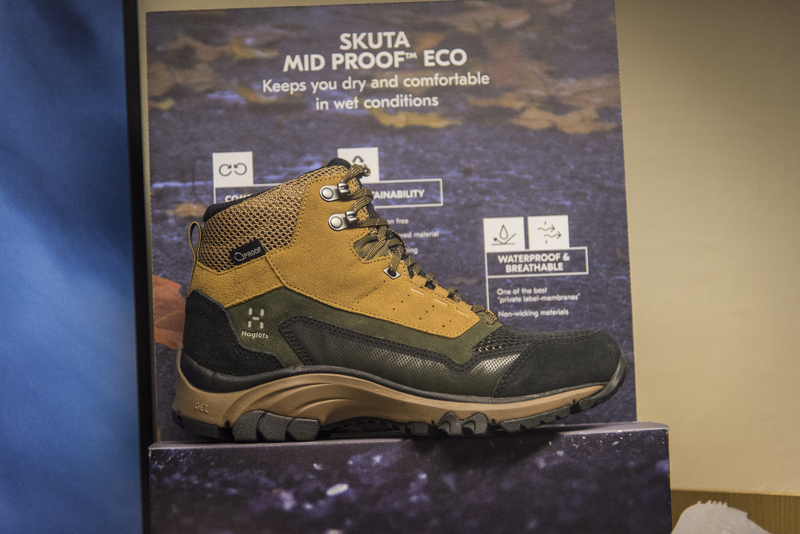 the Skuta Mid is a light and flexible boot with a decent sole unit and a Proof membrane. How that will work compared to a Gore liner is yet to be seen, but these seem solid with a very aggressive retail price point. There’s a Low version too. Tidy. Do I really need to caption this? 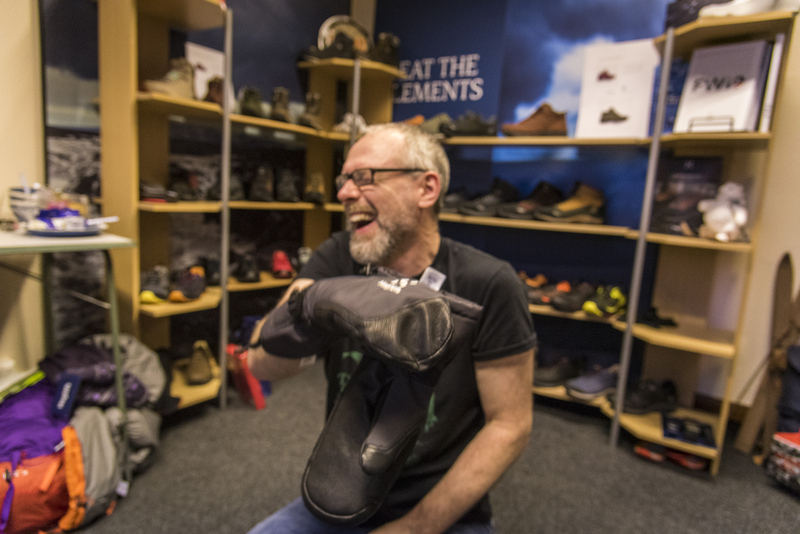 Gus is touting the Trail Fuse, which looks to be a very interesting trail shoe. The ASICS guys have brought their comfort midsole and there’s a mesh upper with a decent sole unit. The GT version has a Gore liner. At around 300g for a size 8, these are going on my wish list. So there you have it, quite a lot of tasty toys for us to play with this time next year. It’s been good to have a wee break and come back to find things moving in the right direction. They were stagnant for a wee while but we’re off and running again. 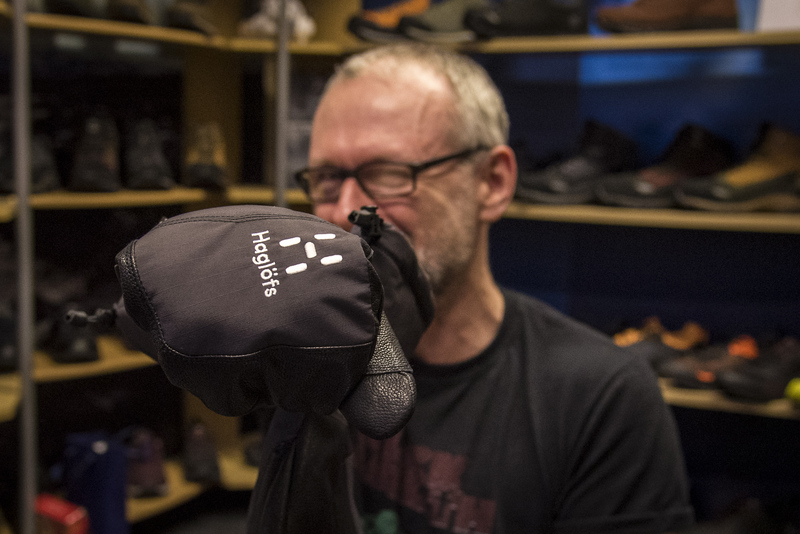 I like what Haglofs are doing, it’s like they’ve found their mojo again and instead of trying to be like every other gear company, they are being themselves. 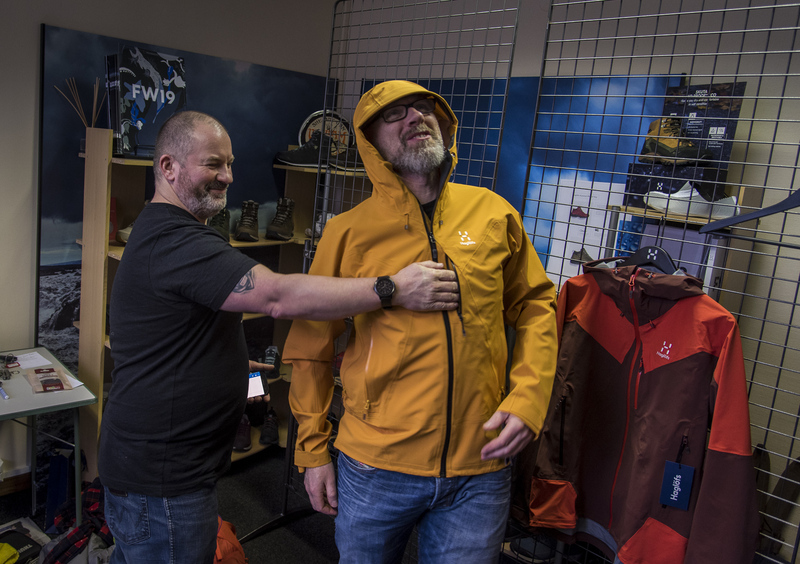 They are making a mix of proper technical kit along with more mainstream gear for people to just want to get outdoors and doing it in a sustainable way that means that there might continue to be an outdoors that people will want to get out to. Not a bad plan I reckon.